It is with great sadness we must inform you that Jeam Jan was purchased by another buyer before we raised her rescue funds. 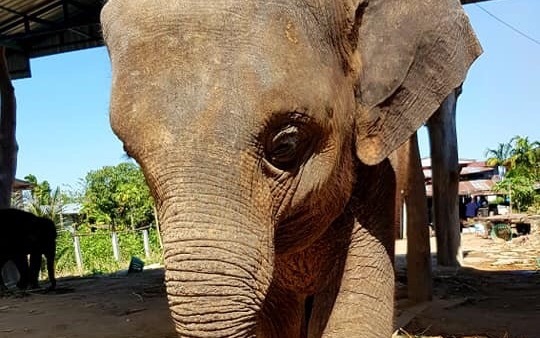 The Elephant Nature Park staff is heartsick to lose her and very disappointed in this development since Lek had already reached an agreement with her owner for her sale. Purchasing an elephant legally is a very complicated and tedious ordeal full of bureaucratic red tape. Lek only ever buys elephants above board but while she was following the rules a less scrupulous buyer swept in and stole Jeam Jan away from us. We are so very sorry for this outcome and will absolutely refund your contribution upon request given the circumstances. However, we hope you will allow us to redirect your funds to another elephant in need named Chana. Chana is a beautiful 8 year old girl with a badly broken leg. She had been working primarily as a street beggar and performer but last May Chana was playing on a termite mound when she fell and got her back leg caught between two trees. She fractured both bones in her right rear leg while trying to free herself and the injury was not properly attended to at the time. Like most elephant owners in Thailand, Chana's knew of Lek and asked her to help. ENP provided x-rays and pain relief and prescribed shelter rest, which did help heal her injury but not completely. Thankfully Chana’s owner realized she would be better off at the sanctuary where she can benefit from better veterinary treatment so she has been relocated to ENP indefinitely. Healing her leg completely would require surgery and steel pins, which is not currently an option but ENP is exploring all possible treatments for her. In the meantime, Chana is already blossoming at the sanctuary. She has a large enclosure space at the clinic to alleviate boredom and has been adopted by Kabu, a 33 year old female who also suffered a broken leg in her youth that was never properly cared for and that has left her permanently disabled. Kabu has had a hard time making friends at the park after so many years of abuse and her own daughter was taken from her and sold, an all too common but no less traumatic experience for captive Asian elephants, so seeing her with Chana is truly heartwarming. A motherless child and a childless mother have found what they both so desperately need in each other. Kabu and Chana are now inseparable and can be found wallowing in Kabu’s mud pit (territory she had previously been very hesitant to share) or enjoying hydrotherapy in the pool which offers excellent weightless treatment for both of their leg injuries. With your permission we would like to apply your contributions from this campaign to Chana’s expenses. For now they consist primarily for her care as for any other elephant at the sanctuary, her food, mahout, enclosure, etc. Eventually she will have greater veterinary expenses to treat her leg so we hope to redirect this social.fund campaign to help pay for them. Again, we are so very sorry not to be able to rescue Jeam Jan at this time and will grab the opportunity should she become available again. If anyone would like a refund please do not hesitate to ask and we’ll be happy to oblige but we do hope you will be pleased to apply your funds to sweet little Chana. Thank you again for your generosity and your understanding. Her name is Jeam Jan. She is 55 years old. Her life has been very difficult. She is blind and both back ankles are badly injured. Her prior work was logging and 3 years ago she was moved to this trekking camp in Phuket, Thailand. She is too tired for this work. She walks so slow and is in a lot of pain. The owner wants to let her go, but he asks for far too much for the sanctuary to afford. Please help contribute to let her go to a sanctuary so she can live the rest of her life in peace. Elephant Nature Park in Thailand is willing to rescue her and have her live the rest of her life in peace and tranquility . It's expensive to rescue an elephant, but anything helps friends! #bekindtoelephants #bethechange. The Elephant Project is hosting this campaign in collaboration with the Abraham Foundation www.abrahamfoundation.org... Your contribution is 100% tax deductible through the Abraham Foundation, a 501c3 nonprofit that is authorized to raise & process donations on behalf of the Elephant Nature Park.